Tri-Mode Tri-Band 900 MHZ and 1800 Mhz is good for all mobile phone providers including Vodafone / O2 / Orange / T-Mobile and any other EU carriers on GSM systems. Having 3 interchangeable whips also allows you to experiment wherever you are for the best aerial. Comes with 3.5 meters of RG58 cable with a Female FME for easy connection to all of our adapters. Strong 5 cm magnetic with rubber shield keeps the aerials secure on a metal surface. Comes with all of our masts, 10 cm, 30 cm and 60 cm whip aerial to interchange when needed on the same magnetic base. With 3dB to 9 dB of gain available, this gives you flexibility to use the smaller aerial in the city and then change to the larger aerial when longer distance or interstate driving is needed. Just place the aerial on the roof or your vehicle for maximum benefit or on the trunk for easier installation. 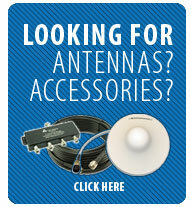 Electrically balanced for Tri-Band performance for the Nextel, Mobile and the PCS bands. Requires an adapter to connect the Mobile phone to the aerial, choose below.